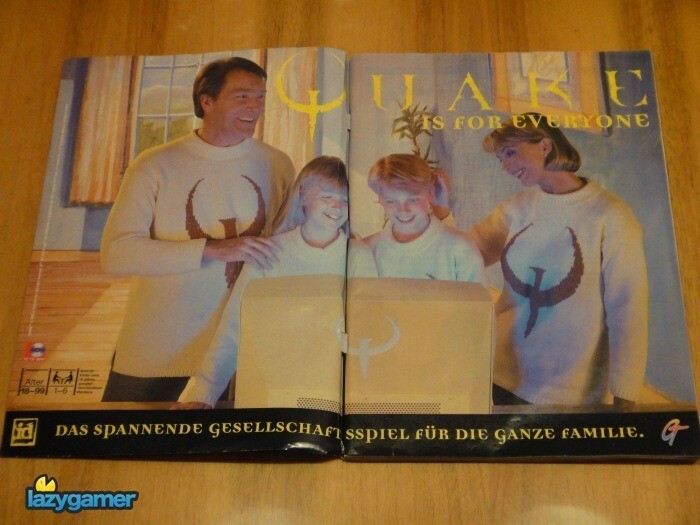 And after watching the most offensive gaming advertisement on the planet we turn out attention to an old German print advert for the original Quake. Now for those that don’t know, Quake is one of my all time favourite games. It was easily one of the best FPS titles ever made and it single-handedly turned me into a multiplayer FPS fanatic. I’d like to think that every true game has played Quake and if you haven’t you should, however that being said. Quake is not a fluffy family game. It’s got blood, gore and demons and it’s pretty much the last game on the planet that I would expect to see advertised by a ridiculously happy family, not to mention a German family with the quake logo sewn into their jerseys.. yes seriously. Take a look at this print advert from way back in 1996… yeah horrifying isn’t it.